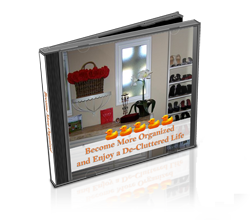 Clutter and Disorganization are an enormous problem in the workplace and in life in general. Although it may be difficult to actually measure the monetary cost of it’s effect at home or in ‘life’ in general, it CAN be measured in the workplace. Keep in mind that clutter comes in many forms. In the workplace, clutter may come in as: actual stuff; co-workers; papers; commitments, calendar, obligations, technology, social media, noise, types of chaos, and much more. One way the actual ‘Clutter’ that comes in can be measured financially is by how many interruptions one experiences during a workday. Each interruption costs a business 6-10 minutes. If one is an employee with a set job, it costs around 6-8 minutes depending on the person. If one is an entrepreneur or small business owner, the costs soar from 8-10 minutes. The reason is that the later group tends to wear ‘more hats’ and is spread out doing several jobs at once. The task in this scenario is an employee prioritizing his tasks and sitting at a desk typing up a detailed proposal for a client. Normally, this particular exercise will take 1 hour. 8:00AM- Sitting at desk working on contract. 8:10AM- Phone rings. It is ignored. 8:16AM-Sitting at desk working on contract. 8:20AM-Facebook notification sounds. Someone messaged. It is ignored. 8:26AM-Sitting at desk working on contract. 8:29AM- Phone beeps. A text was received. It is ignored. 8:35AM-Sitting at desk working on contract. 8:46-Sitting at desk working on contract. 8:49- E-mail message received. The sound is heard. 8:55- Sitting at desk working on contract. of work have been spent on the contract in one hour and 3 minutes. 36 minutes have been spent switching gears and trying to get refocused after a distraction. Normally, there are many more beeps and alarms and sounds that occur that listed in this hypothetical scenario. It is also important to note that an attempt was made in this scenario to ignore the distractions or not respond. IF an email or a Facebook message was addressed, that time spent on addressing the message would be added onto the 6 minutes it takes to get back on track. In addition, if one were a small business owner or entrepreneur, the time spent on trying to get back on track would have been 60 minutes and it would be 9:27AM with the contract unfinished. How does this ‘CLUTTER’, in this case of simple interruptions or distractions translate to MONEY for a business? A contract that should cost the business $30 to have written will actually cost $65 to write at this same rate. This is just a simple example of the costs of interruptions or ‘clutter’. Unfortunately, in today’s workplace, a person rarely has the luxury to sit down and focus on or two hours on a contract. Many times they are expected to be doing much more or ‘multi-tasking’. Meetings are attended. Conference calls are had. Fires are put out. It is painfully obvious to see how a company looses productivity and efficiency of its employees by ‘clutter’, chaos and interruptions.